An amazing little amplifier that challenges (and in most cases), it's a class above the likes of Rotel, NAD, Cambridge Audio, Arcam etc. In my case, I have it connected to a pair of JMLabs Electra 926 speakers, a ClearAudio Turn table, a Harman Kardon tuner and a Sony CD Player feeding a NAD M51 DAC. The sound is crisp, fast and very detailed and, despite its modest output power, it drives the large floorstanders with no problem even at high sound levels without clipping. The remote control is useful with source selection, volume settings and stand by controls, and works really well from quite a distance and from different angles. In my view, - and to my surprise - this is one very underrated amplifier offering sound way beyond its price bracket. The included phono stage is superb and a perfect match with my BenzMicro cartridge I use. As an added bonus, an excellent headphone amplifier is included which has no problem with my AKG701 cans. In all, this amp is offering a touch of 'high end' sound at a budget price, provided it is connected to really good speakers and sources. Very, very enjoyable and highly recommended! No weaknesses really in sound quality. I would have liked to see a detachable power cable so, different cables could be tried. I can't really think of anything else that could make it better. It is THAT good! BTW, this review is for the Mark II version. We have 3 sets of Teac's 300 series running in the family, 2 sets bought in 2000 (build in Japan, 35 Watt) and another set (MK2 version, 45 Watt, build in China), bought in 2006. ThoseTeac's are completely underrated. At the moment I drive my ProAc 1SC speakers with the MK 2 version, which appears to be an unfair match. Yes, there are better components out there on the market, but for that money? The 300 MK 3 series is running out now and will be soon replaced by the 380 series. That means you can buy the 300 models in Europe for 500 to 600 Euros, that is for the amp, cd and tuner together. Staggering value for money. Over the years I was comparing them to (sometimes) more expensive products from Marantz, Kenwood, Quad, NAD and Sony. Except for the Quad, which has a price tag 5 times of the Teac, all the others could not match the sonical performance of those little Teac's. They sound fresh, with plenty of detail. The soundstage is there, with an airy feel. There claimed 45 Watt might be a bit on the high side, but it is sufficient for most situations. Up to medium volume level they are able to drive the ProAc's alright. One thing which is noticable, the Japan versions are better manufactured than the China version, less wobly knobs and a more refined casework. In direct comparsion to the Quad amp (34/306) the Teac lacks a bit of giving voices enough body, and the Quad has a warmer overall sound. Also the Quad has the same claimed 45 Watts, the Quad appears to have more torque or power. 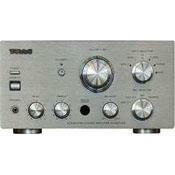 To really better the Teac's in pure sound quality, you need to spend at least three times as much money. Strongly recommended!